Hard enamel, prepared with mineral powders applied with a brush and cured at about 800°C (1472°F). Synthetic (soft) enamel, applied with a syringe on the different divided areas. Accuracy and speed, two crucial skills required for this specific step of our process, can only be acquired through much experience. Some details on the medal can also be highlighted with a shining polish. 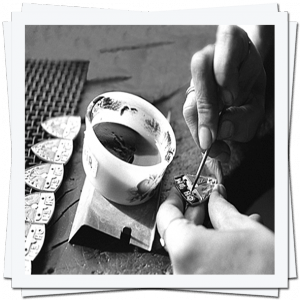 In this workshop, pieces are polished one by one until their details shine perfectly. The touches of colours can also be polished to erase the “basin” effect.